WHERE: Downtown – 516 North Tampa Street. WHAT: Vietnamese cuisine so fresh, healthy and nutritious it should practically be prescribed by a doctor. And surprisingly this good-for-you-food is backed by awesome flavors so you don’t have to sacrifice taste for health factor. WHEN (To Go): Before or after Rock the Park, Free Yoga in the Park or any other Downtown event. There is life after five in Tampa’s Downtown, so use this as an excuse to go find it. WHO (To Take With You): The friend or family member willing to try something new. This isn’t Burger King and sometimes new foreign menus can be pretty intimidating. So bring someone who won’t be afraid to order a dish or beer they don’t know how to pronounce. It tastes good to eat outside of the box. 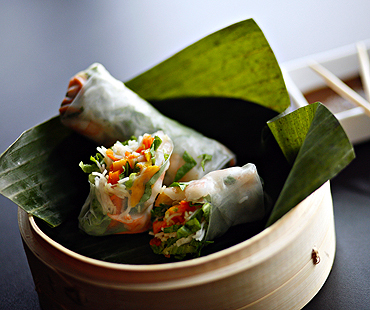 WHY: Because you can eat about 5 Bamboozle Rolls without any of that overindulgent guilt. The house special Bamboozle Rolls come in a dozen different variations of vermicelli rice noodles, fruits, veggies, chicken, tofu, pork, prawn or beef wrapped in rice paper.